Microsoft introduced its next-generation Surface tablets on Monday, including a professional model that allows people to use it more like a laptop or a desktop. The new tablets were unveiled at an event in New York City that tried to capture some of the excitement and publicity buzz that Apple product launches have become famous for. Microsoft is aiming to boost its tablet business as sales of traditional desktop and laptop computers decline. The new Surface Pro 2, the higher-end model, is targeted at professionals who want the full power of a laptop in a tablet-style device. It has a higher-resolution screen and a newly designed kickstand built in to make it easier to use on laps. In the past, it worked best on a flat surface such as a table. Microsoft says the Pro 2 also offers a 75 percent improvement in battery life over the previous model. It features a processing chip that uses less energy and doesn't require a fan. Known as Haswell, the chip is already used in laptops from Apple, Samsung, Dell and other companies. There's also a new cover accessory that extends battery life even further. An optional docking station allows the Pro 2 to be used like a laptop. A cheaper model, the Surface 2, offers a better screen and other improvements over last year's Surface RT. The Surface 2 will retail for $449, while the Surface Pro 2 starts $899. Both models go on sale Oct. 22, and Microsoft's Web site says they will be available for preorder "soon." Microsoft is also preparing to release an update to its Windows 8 operating system, scheduled for Oct. 17. Among other things, Windows 8.1 will be usable on smaller touch screens. 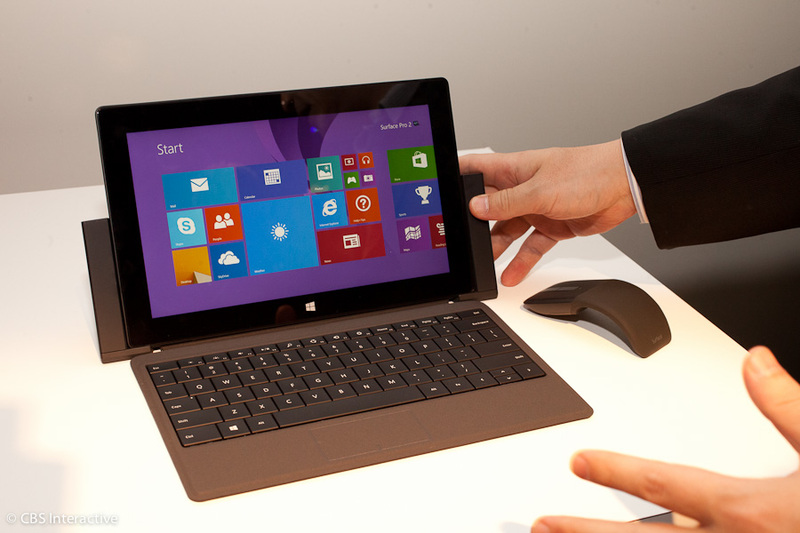 The previous version of Windows 8 was limited to tablets with 10-inch to 12-inch screens. Surface tablets were first introduced last October, but so far but sales have been disappointing. Microsoft shipped about a million tablets in the first three months of 2013, according to research firm IDC. The shipments gave Microsoft only a 2 percent share of the tablet market in the first quarter. By the second quarter, Microsoft tablets dropped out of IDC's Top 5. Microsoft, which is based in Redmond, Wash., absorbed a $900 million charge in the April-June period to account for its expected losses from the Surface RT after it slashed prices to try to stimulate demand. The $150 cut brought the price of the Surface RT with 32 gigabytes of memory to $349. Last week, the company announced a "trade in" program, offering $200 or more in Microsoft store credit in exchange for a "gently used" iPad. The promotion encourages iPad owners to use the store credit to get a Surface tablet instead. Did Microsoft Surface sales sink more than thought?